Gwaii Haanas is a protected area of Haida Gwaii, encompassing hundreds of small islands, forested mountains, and the Haida heritage sites. Few cruisers visit it, because of the time and effort of getting across Hecate Strait. 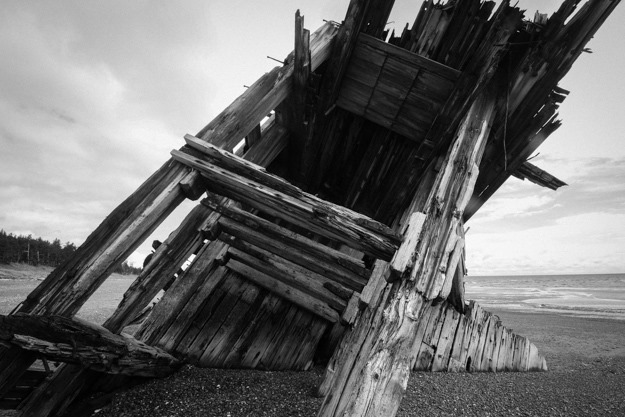 We were pretty excited to be heading there after waiting out 5 days of gales in Sandspit. The highlights for us were the beautiful hot springs at Hotsprings Island and SGang Gwaii (a UNESCO world heritage site with amazingly well preserved poles). This entry was posted in cruises on June 25, 2018 by Patrick. While cruising for extended periods in remote areas, refilling our water tanks is often the limiting factor in how long we can go between marinas. We’re a “water light” boat, with only a 29 gallon tank plus about 12 gallons in jugs on deck. This easily lasts us 1 1/2 to 2 weeks on our water-light budget (using about 3-4 gallons per day). 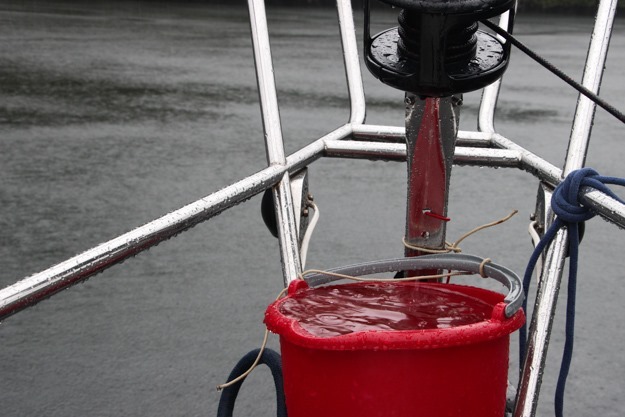 Our 41 gallons is far less than most long-distance cruising boats carry though – on the order of 75 to 150 gallons. Our boat was originally equipped with 75 gallon capacity, and I thought I’d have to add back one of the removed water tanks, but we’ve found it not to be necessary. 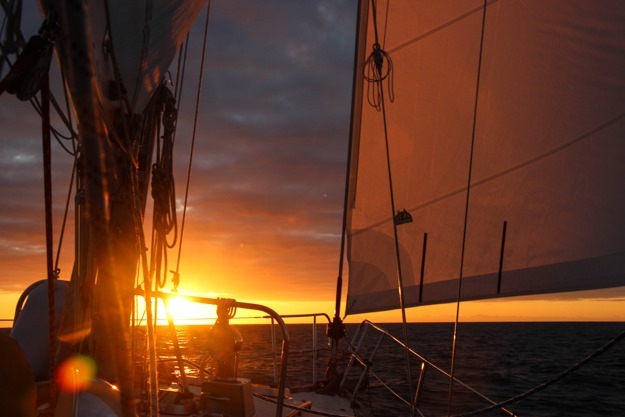 More water adds a lot of weight, takes away storage space, and decreases sailing performance – a priority for us. 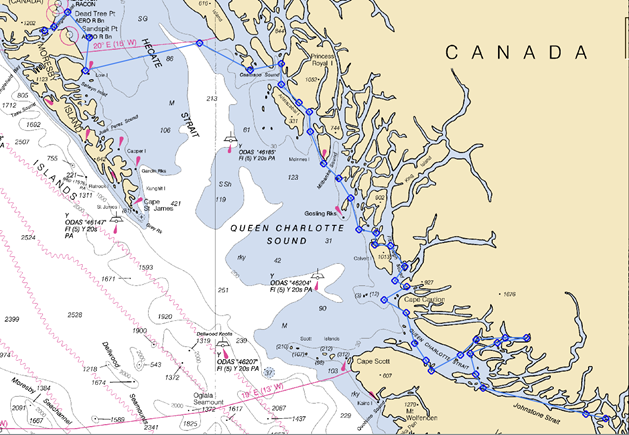 But sometimes we want to go a bit longer between marinas, such as when cruising from the North Coast of BC to the south of Haida Gwaii, areas with no convenient marinas. Some boats buy expensive watermakers which are infamous for being a maintenance headache. Here in the Pacific Northwest though we have a free, frequent source of pure water – rain! For a while I’ve thought it’d be great to be able to catch some of it, but it’s not as simple as it seems. The main problem is catching a lot of it, and getting clean water that is free of salt (our decks are usually covered in salt) and other contaminants. During three days this May holed up in Clark Cove while a gale blew through, bringing near-constant rain, I tried out a few improvised ideas, using only what we already had on the boat. This entry was posted in howto on June 21, 2018 by Patrick. After arriving in Skidegate Inlet, the center of Haida Gwaii and the biggest port area, we quickly realized road tripping with a rental car would be the best way to explore Moresby Island. 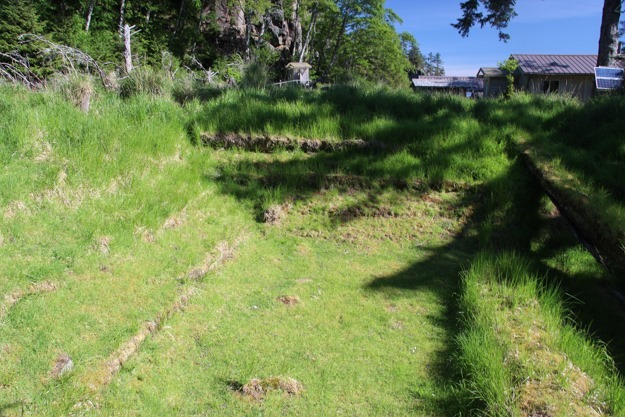 Moresby is the north big island of Haida Gwaii, and it doesn’t have many good anchorages. For our sailing style, Moresby is best explored by car. We rented a car in Queen Charlotte City for two days and focused on the phenomenal hikes and beaches. 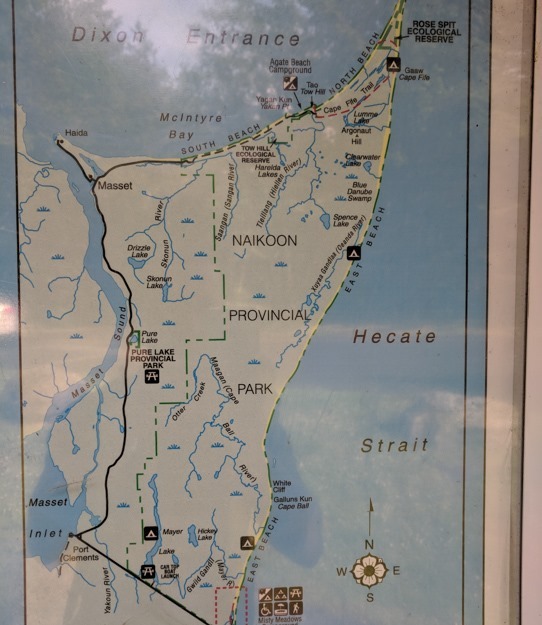 The first day we drove north to Masset, doing the Pesuta Shipwreck trail, the Tow Hill hike, and having dinner at Charters in Masset. The second day we stayed more local, driving just to Skidegate for the Spirit Lake trail, the Haida heritage center, coffee at Jag’s cafe, and stocking up with provisions at two of the grocery stores. This entry was posted in cruises on June 18, 2018 by Patrick. After our overnight passage across Hecate Strait we were very grateful to be in Haida Gwaii, but dead tired. We spent the first day just sleeping and recuperating. The next morning dawned sunny and windless in Skedans Bay, so we set up the dinghy and motored over to the Haida heritage site at Skedans point. 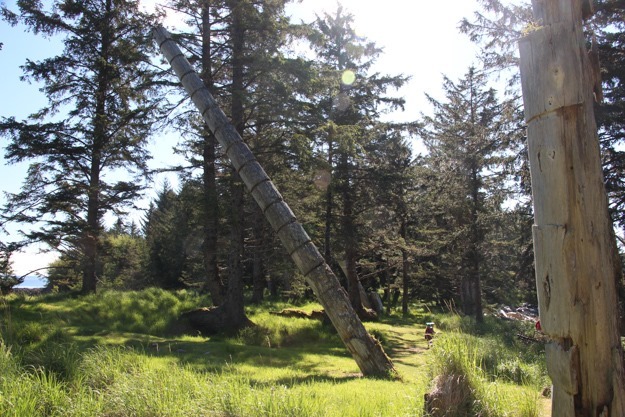 The Skedans site is where a settlement of Haida people originally lived, and a number of totem poles still remain, slowly being reabsorbed into the earth. We were fascinated by how spruce trees used the cedar longhouse posts as nurse logs – you could see a huge healthy spruce tree enveloping the remains of a cedar log. The two caretakers (watchmen/women) gave us an hour-long tour of the site, telling us of Haida history and traditions. It felt special seeing history in person rather than in a museum. It was clear they continue to treasure their cultural history. It would’ve been great to stay longer, but we had plans to move to Skidegate inlet that afternoon. 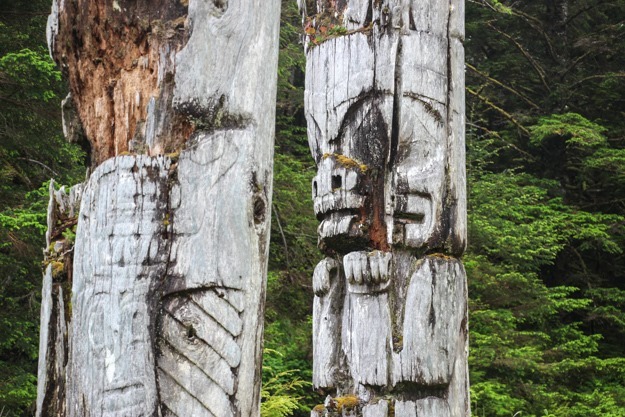 A ceremonial pole – each notch indicates a potlatch that took place. This entry was posted in cruises on June 14, 2018 by Patrick. We’ve been in Skidegate Inlet for a week and a half now – some of that intentional, but for the last 5 days we’ve been waiting for a weather window to get out. It’s difficult having the patience to wait for the right weather conditions. The hardest part is not knowing when we’ll be going. Conditions and forecasts are changing daily, and each time we get optimistic by a good forecast, our hopes are dashed when a new southerly gale moves in. 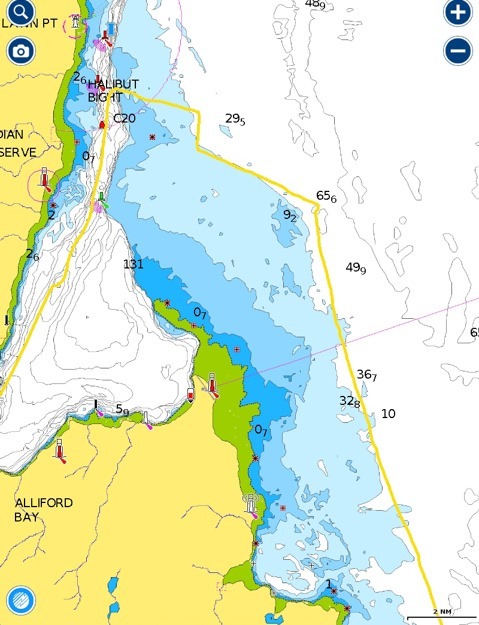 The challenge to getting out of Skidegate Inlet is that it has a long shallow bar and it’s near the shallow portion of Hecate Strait, which kicks up very steep waves with only a moderate amount of wind. 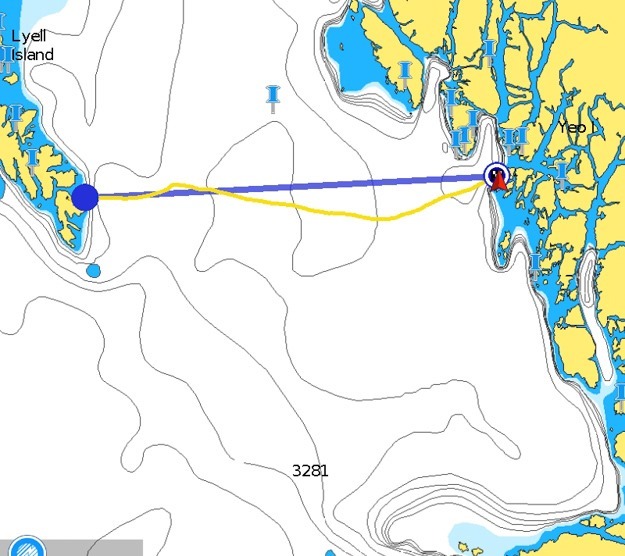 It has no anchorages of refuge to the north (nowhere to run downwind if we get stuck in a southerly that is too strong), and the closest anchorage to the south is about 50-60 miles – a long run if you’re going upwind. This entry was posted in cruises on June 11, 2018 by Patrick.